The Bridgers reveal their bedrooms for young and old. 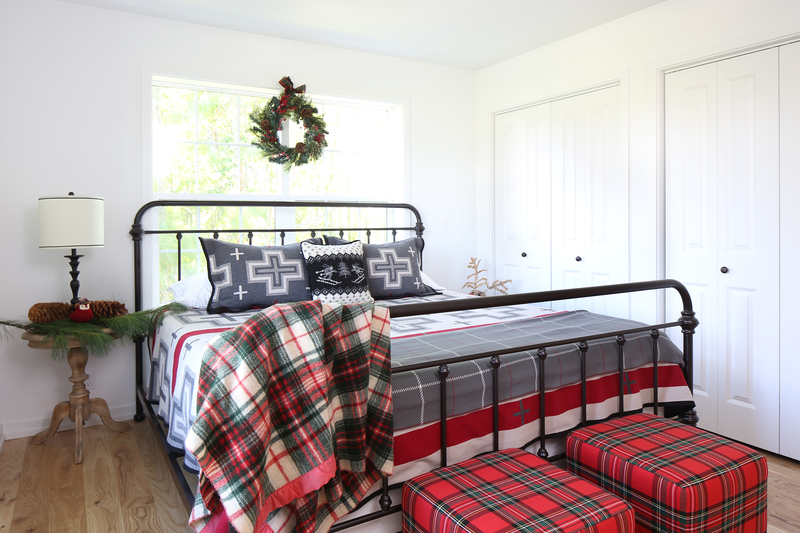 The master bedroom illustrates the success of the Bridgers’ less-is-more approach: a king-size bed with bedding they love, and just the right amount of Christmas décor to keep everything crisp. The wicker trunk belonged to Gabe as a child, and now it offers precious storage space and a surface to display whimsical, vintage Christmas décor. There’s something magical about the nights before Christmas and the contrast between the cold darkness outside and the warmth, light and coziness inside. With the new bedrooms carefully tucked into the striking addition to their Michigan farmhouse, the Bridgers’ Orchard Hill Farm offers an especially cozy place to enjoy the holiday warmth. How to fit “three bedrooms into a space only really fit for two,” plus a full bathroom, presented the Bridgers with a puzzle. If you’ve been following the renovation process, however, you know by now that the Bridgers are not ones to shrink away from a challenge. They solved it by making two of the bedrooms “tiny” with a ship bed in one room and bunk beds in another. “We’re ok with it because there is so much open space, and we want to encourage people to be in more communal spaces,” Christine says. In fact, the bedrooms ended up working very well. 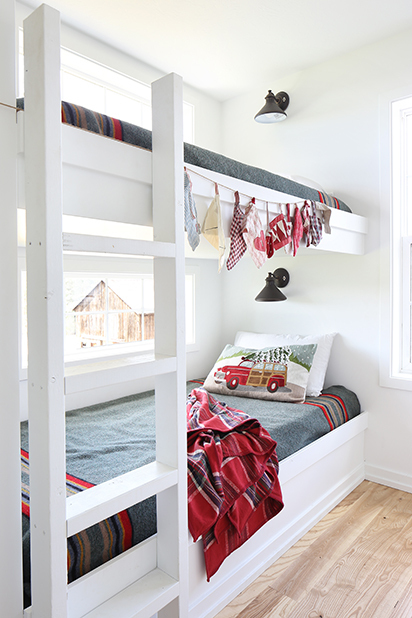 The framed built-in bed ended up being “the coziest nook in the house.” Childhood Christmases are especially magical, and the kids’ room with double bunk beds certainly facilitates holidays to remember. The room is always a hit because it brings back childhood memories. Each bed is covered in a cozy green Pendleton blanket, has its own light switch and a view out over the orchard. Christine’s sister has two kids, and the cousins love spending time together. “They are more like brothers and sisters than cousins,” Christine says. The double bunk beds sleep all four cousins, who also get matching pajamas for Christmas every year. Gabe’s old childhood trunk sits in the corner, topped with a mini tree and vintage toys. Cousins Phoenix, Ivy, Emelia and Jenson have matching beds and matching Christmas pajamas. Christine calls this bedroom “the coziest nook in the house.” Curling up under the Pendleton National Parks blanket with a clear view out the window is certainly inviting. The room also showcases the Bridgers’ holiday style, with vintage ice skates hanging over the door and just enough greenery and meaningful objects to give it a festive feel. Each bed in the kids’ room includes a mounted reading light and a window looking out over the orchard. A garland of vintage fabric adds a playful, festive touch. The shelves flanking the built-in bed make an ideal space to let small décor items shine. 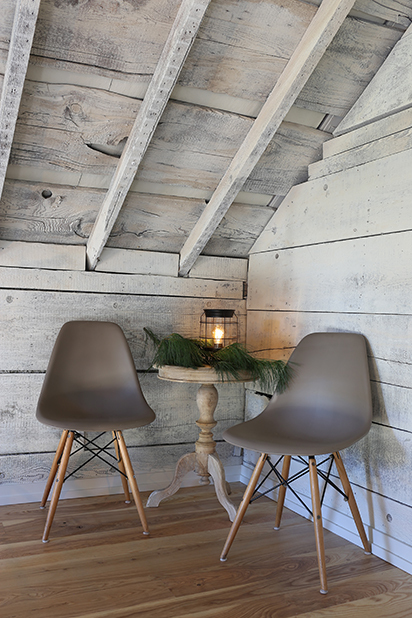 The loft is one of the best areas of the house, Christine notes. The Eames-inspired chairs carry some of the industrial flair from other parts of the house. Rather than overwhelm the small spaces, and in keeping with time-period appropriateness and the home’s orchard location, the Bridgers’ holiday décor is tasteful and meaningful. The ship bed, for instance, is framed by two built-in shelves, providing a perfect place to display little knickknacks that might otherwise get lost in larger areas. It’s also a great place to display the Bridgers’ archive of their Christmas cards, for a fun holiday time capsule. For the master bedroom, Christine and Gabe have learned from the past. They knew it was their priority to have a king-size bed and good bedding. “We’ve scrimped there before,” Christine says, “and regretted it.” This time, they adopted the philosophy of “Less stuff but better stuff,” especially for something they use every night. The ski blanket and plaid ottomans add to the coziness and “crisp Christmas” theme. Stay tuned next issue for the final reveal and a full house tour of the Bridger’s farmhouse!